I attended the ninth DDD on Saturday (see http://developerdeveloperdeveloper.com/ ), and, as usual, there were many interesting presentations. Sam Bourton extolled the virtues of Microsoft Expression Blend for WPF and Silverlight developers (NOT designers note! ), and he showed a neat trick to create icons quickly by using Wingding symbols. Basically, he created a text block in Blend, inserted a symbol from one of the three Wingding fonts character maps, then converted the symbol to a path. 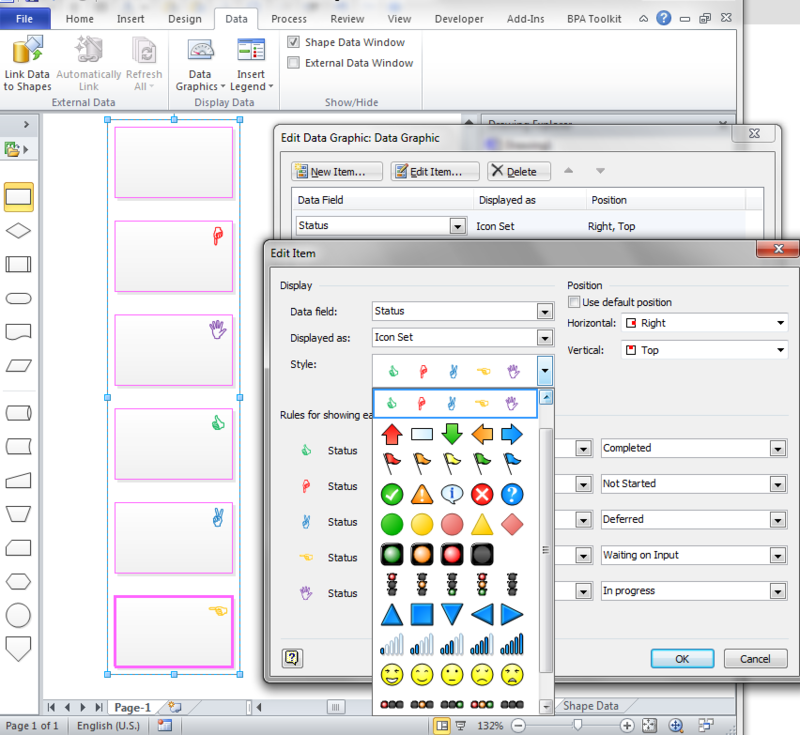 It struck me that we could do a similar trick in Visio to create Data Graphic Icon Sets cheaply … so here goes….. In this example, I am using a Process shape from the Basic Flowchart stencil because it has a Status Shape Data row that is defined as a choice from six different values (the first value is an empty text string). Then I applied the Trend Arrow 1 Icon Set to my six Process shapes, and then opened the Drawing Explorer window (you can turn on Developer Mode from File \ Options \ Advanced ). 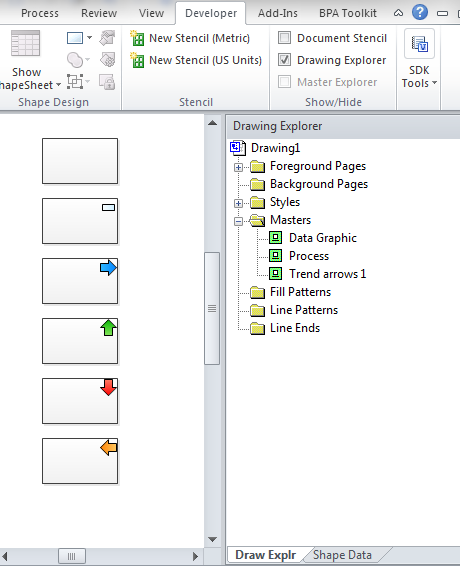 Then I duplicated the Trend arrows 1 master and renamed it as Symbol icons 1 (just use the right mouse menu in the Drawing Explorer window). 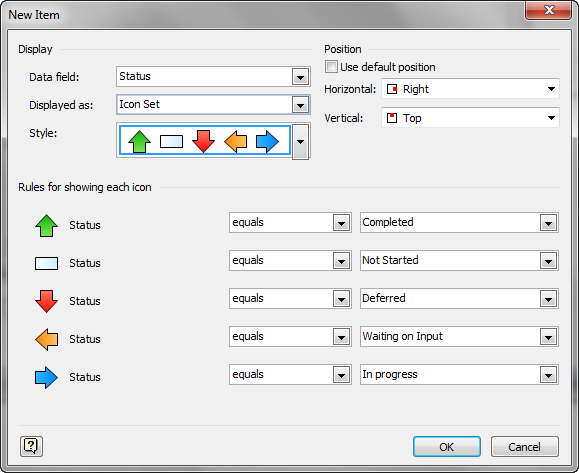 I selected the arrow shape, pressed F2 for Text Edit, then used the Insert \ Symbol to select the icons that I wanted. The Wingdings, Wingdings 2 and Wingdings 3 font maps should give you a few to choose from. In fact, I inserted 5 symbols then formatted each character with the font color of my choosing. 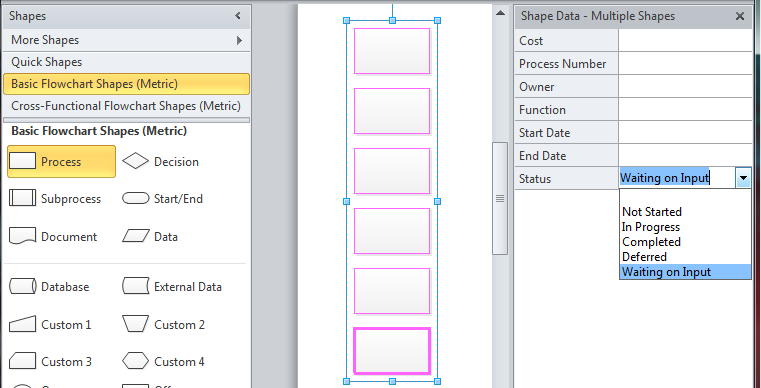 This will cause Visio to create a row for each Character, explicitly expressing the Font, Size, Color, etc, values. returned the string “CHAEI” for the hand symbols that I selected. 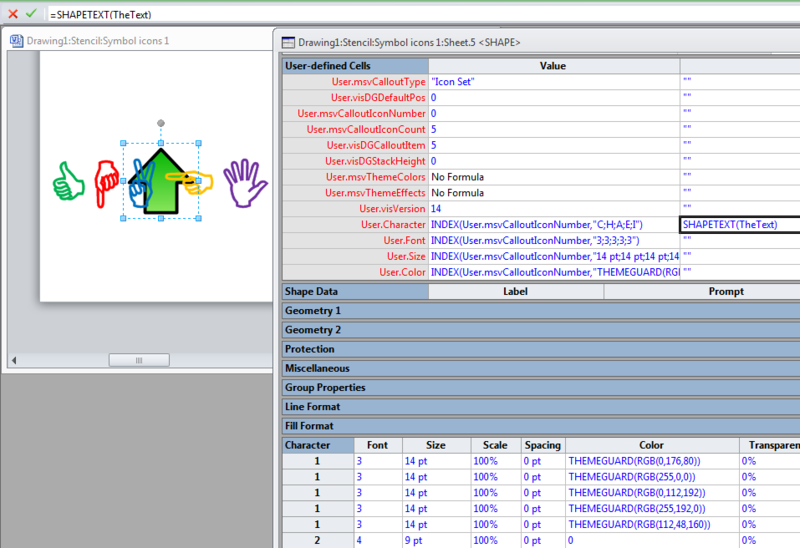 I put this formula in the Uset.Character.Prompt cell and switched the display to Values mode in order to see this. 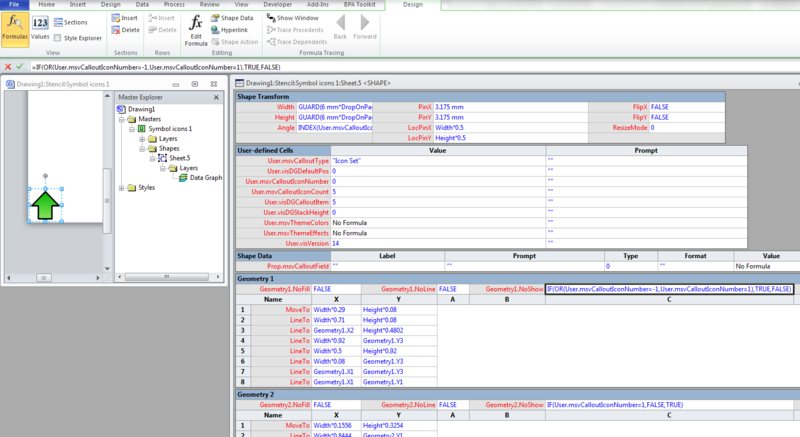 Now, I could select the whole text block, and Insert \ Field, and select the User-defined cells \ Character field. This will automatically create the Text Fields section, with User.Character as the Value. Also, the rows in the Character section are reduced because 5 characters have been replaced with 1. I then updated the formulae of the Font, Size and Color cells in the first row, to reference the User.Font, User.Size and User.Color cells that I created earlier. The original arrow graphics are no longer required, so I just deleted the two Geometry sections. Finally, I could test the symbols by changing the value in the User.msvCalloutIconNumber cell between 0 to 4 to ensure that the hand changed. Any other value causes no hand to be displayed I then closed the Master edit and applied the new icon set by editing the Data Graphics. So, there you are. You can create your own icon sets from any of the symbols in the font maps. Of course, you can just duplicate the new Symbol Icons 1 master to shortcut the steps now!